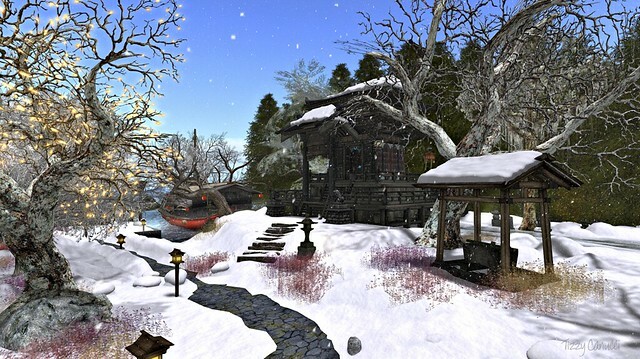 It’s The Most Wonderful Time Of The Year, or so it is claimed, and around Second Life various places have turned white. 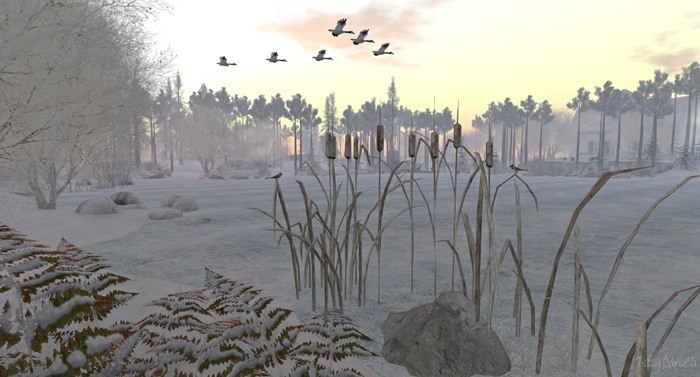 So this is a short look at how snow (and often by association, Christmas) are depicted in different places in Second Life this year. Clearly, this is towards the north of the northern hemisphere orientated. Some of the great places last year are out of the running. Timeless Memories is now Mediterranean, Aspen Fell is autumnal with the odd bit of snow and bathed in a strange and slightly nauseous yellow colour. Hamba Kahle is now medieval residential. However, The Pines at Jacobs Pond is back. The trees are now almost exclusively pines, making it even more atmospheric this year. Clothing is optional, and presumably establishing a market for frostbite tattoo layers. ‘Pines at Jacobs Pond’. Photo by Tizzy Canucci on Flickr. Calas Galadhon’s ‘White Christmas’ is at the sentimental end of things and very definitely Christmassy, poinsettias flaming at the tp point. On arrival, there are romantic sleds, skating involving some remarkable flexibility, and giant toy soldiers in the dance hall. This is kitsch drawn (as it should be) big. Let it Snow is a little more realistic though again it aims squarely at the traditional Christmas elements – the red post box, bow-windowed shop, twinkling Christmas tree, tidy snow and snowman. The Trace Too is Christmas Card romanticism, with a greater attempt to landscape realistically. It’s a lovely build and has been carefully thought through. There is no music stream, which is no bad thing, though the birdsong struck me as a bit spring-like. It’s quite a sentimental portrayal, which as someone who lives in a rural area, reminds me of places that are visited by outsiders rather than lived in, immaculately kept but hollow inside. A Christmas Carol shows what it says. If this popularises Dickens, then it has to be good – and to be honest, I haven’t read Christmas Carol through. However this is a remarkably clean idea of Dickensian London, very flat and tidy, not full of smoke and soot, and no sense of the incessant clattering of iron clad wheels on cobbles. It occurs to me that this is very Second Life 2.0 down to the ad board at the landing point – and on cue a scantily clad av passes by pushing a double-buggy as if to confirm the point with a stereotype. If you want to get the feel of a city of the time Pfaffenthal in 1867 is more effective. However, the interior scene (almost 360 degree view below) with Bob Cratchit and Scrooge very much exploits the present capabilities of Second Life. ‘A Christmas Carol’. Photo by Tizzy Canucci on Flickr. Crestwick Island is the modern urban idea of snow, tidied into piles between sidewalks and road, leaving the faintest hint of snow on the sidewalk. Enough snow to feel seasonal, not enough to be a problem, and certainly not in the way. ‘Snow at Crestwick’. Photo by Tizzy Canucci on Flickr. Furillen is the complete opposite of romantic, as it represents snow-as-ordinary in the bleakness of winter in a run-down Swedish town. This is not twee, nor Christmassy, and definitely not where Santa Claus lives. A great build. The last two places are Japanese, and I have a real liking for their interpretion of snow. Nagare is just a small area with a great combination of colour against white. The sound stream is traditional Japanese music that definitely adds to the atmosphere. Blue Lotus has moved location. 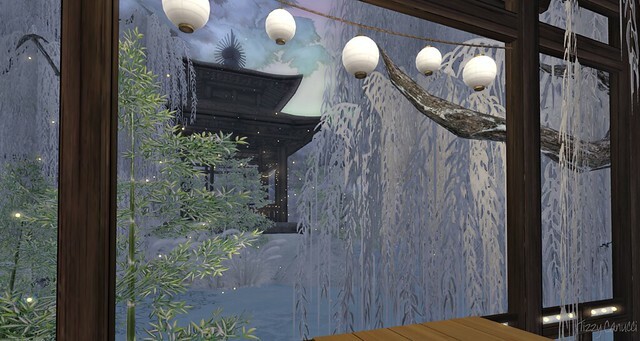 It now fits onto one sim and has dropped the traditional Japanese music for plinky piano music. It is moody with a real sense of cold and imminent snow. It was probably my favourite winter place last year and so far again is this years. It is difficult to photograph without losing the atmosphere, as the shots looks quite flat. In the end, Second Life is designed for immersivity in three dimensions – not everything can be flattened into a 2d photograph.